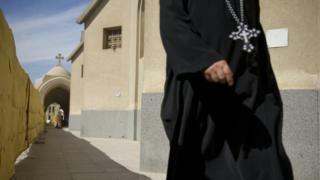 Prosecutors in Egypt have charged a defrocked monk with the murder of a Coptic Christian Bishop at a desert monastery. Bishop Epiphanius, 64, was found dead in a pool of blood at Saint Macarius Monastery in Wadi Natroun, north-west of Cairo, on 29 July. Wael Saad, who had been a monk at the monastery, reportedly told prosecutors he used an iron pole to bludgeon the bishop to death. The murder of Bishop Epiphanius shocked the Coptic Church, whose adherents make up about 10% of Egypt’s population. Wael Saad, who as a monk was known as Isaiah al-Makari, was stripped of his religious title following the bishop’s death. The church initially said it was because he had been investigated over long-standing violations of his duties. Prosecutors in Alexandria say he was formally charged on Friday and placed in detention pending further investigations. In the wake of the bishop’s death, the Coptic Church instituted a crackdown on clergy behaviour and froze the recruitment of new monks for a year. Monks were ordered to close their social media accounts and Coptic Orthodox Pope Tawadros II also closed his official Facebook page. Correspondent say the measures suggest dissent within the Coptic Church that could be linked to the bishop’s murder. The Church has not commented.